Protein phosphorylation plays central regulatory roles in DNA damage repair and signaling. Protein kinases of the phosphatidylinositol 3-kinase-related kinase family ATM, ATR, and DNA-PKcs mediate phosphorylation of hundreds of substrates after DNA damage and thereby orchestrate the cellular response to DNA damage. Protein phosphorylation can be studied using antibodies that specifically recognize phosphorylated protein species; however, this approach is limited by existing antibodies and does not permit unbiased discovery of phosphorylation sites or analyzing phosphorylation sites in a high-throughput manner. Mass spectrometry (MS)-based proteomics has emerged as a powerful method for identification of phosphorylation sites on individual proteins and proteome-wide. To identify phosphorylation sites, proteins are digested into peptides and phosphopeptides are enriched using titanium dioxide (TiO2)-based chromatography followed by the identification by liquid chromatography-tandem mass spectrometry (LC-MS/MS). 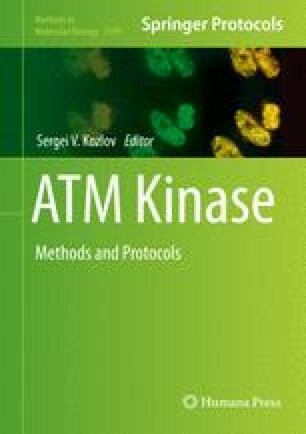 Quantitative proteomics approaches, such as stable isotope labeling with amino acids in cell culture (SILAC), enable relative quantification of phosphopeptide abundance in different conditions. Here, we describe a streamlined protocol for enrichment of phosphopeptides using TiO2-based chromatography, and outline the application of quantitative phosphoproteomics for the identification of DNA damage-induced phosphorylation and substrates of kinases functioning after DNA damage. The research in PB’s group is supported by the German Research Foundation (Emmy Noether Program, BE 5342/1-1 and SFB 1177 on Selective Autophagy) and the Marie Curie Career Integration Grant from the European Commision (grant agreement number: 630763). The research in SAW’s group is supported by the LOEWE program Ubiquitin Networks (Ub-Net) of the State of Hesse (Germany).